In an older post I have shared a recipe for making ricotta cheese. Paneer or some call it Indian Cottage Cheese, tastes almost the same as ricotta. 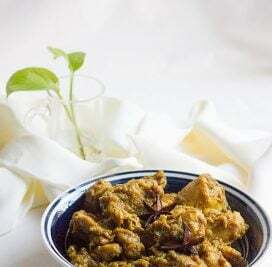 It is a straightforward recipe, and hardly takes time, let’s learn how to make Paneer. I believe this cheese holds better than ricotta, Ricotta cheese is softer in texture than Paneer, only because Paneer is drained well from whey. But in general there is nothing you can do with ricotta that you can’t do with Paneer. The first time I saw this cheese, I thought it’s Tofu. Now, I know that many like to eat Tofu, but I just can’t develop a taste for it! What I like about Paneer is, when it’s fried, it’s crunchy from outside, creamy and rich from the inside. Mix water with lemon juice and keep aside. In a sauce pan add milk and salt and bring it to a boil. Keep stirring occasionally to prevent milk from burning at the bottom. When the milk boils, slowly add the lemon water mixture and gently stir. The milk solids will start to separate from they whey. Turn off heat. When milk solids completely separate, the whey will look greenish yellow. Line cheese cloths in a colander. Pour the whey with milk solids in to the cheese cloth. Collect the corners of the cheesecloth in your hand, with the other hand squeeze remaining whey from milk solids. You can do this only after it cools down, to avoid burning your hand. Place the Paneer while in cheesecloth on a cutting bored and place something heavy on top for 40 minutes. This will bring out more whey. 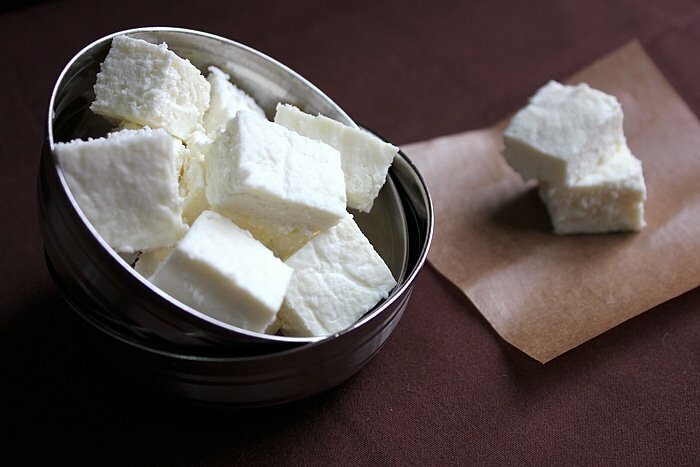 Remove the Paneer from cheesecloth and cut in cubes. It's best to use immediately but, if you want to use it later. Place it in a Ziploc bag and freeze for at least 2 weeks. I love paneer! And I always make it at home 🙂 Though I do not add salt. 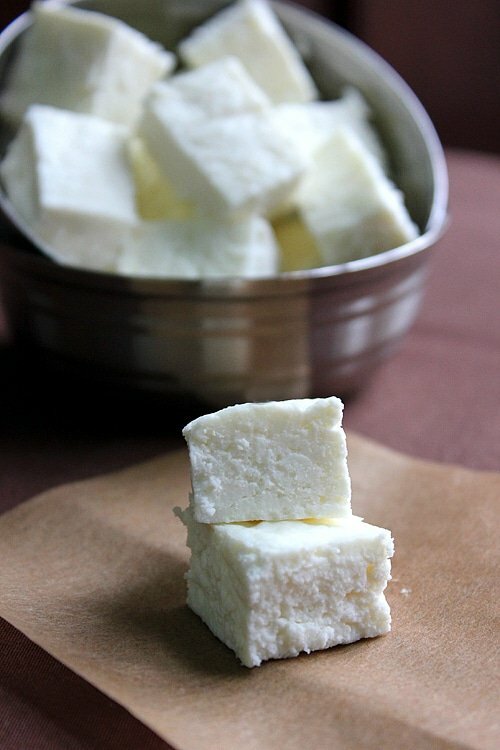 I’ve made fresh cheeses like Paneer many times, and they really are quite simple to make. I suggest that if you use cheesecloth, you should use two or three layers; butter muslin works quite well and you only need one layer. Thanks for the tip 🙂 Yes, two layers of cheesecloth works great with this cheese. 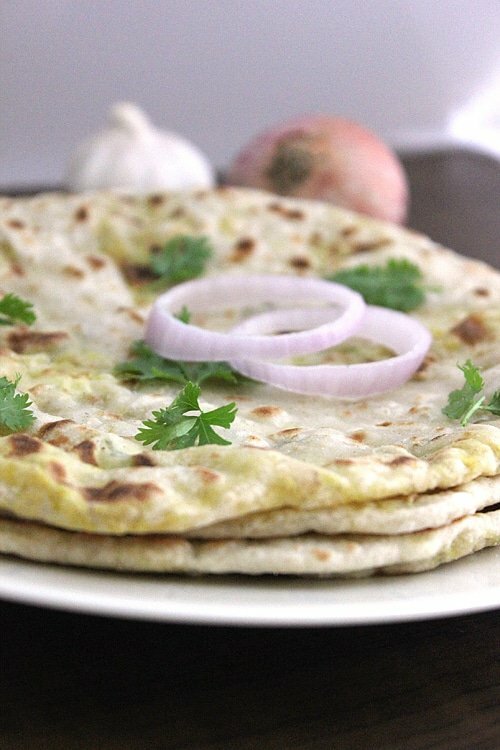 I have always wanted to make paneer…thanks for sharing the recipe. And yes, they look so much like tofu. Dear Muna! I have tagged you in my 11! 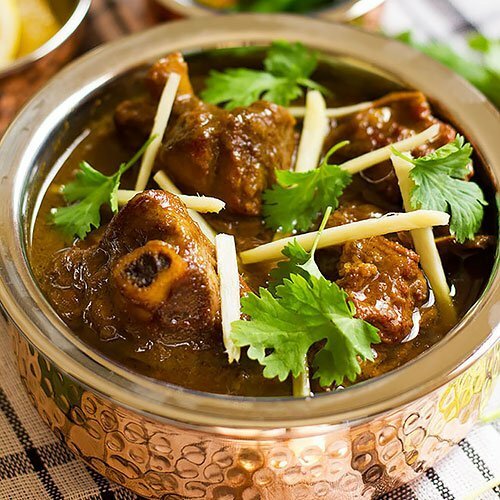 I have not yet tried Paneer yet, but I heard the nearest Indian store carries it. However, I’m actually surprised with the simple ingredients list and instruction! Really? Maybe I can make it at home! Yes, It’s really easy to make it at home, and it tastes far much better and creamier than the store bought. Great pics Muna, and very easy recipe.